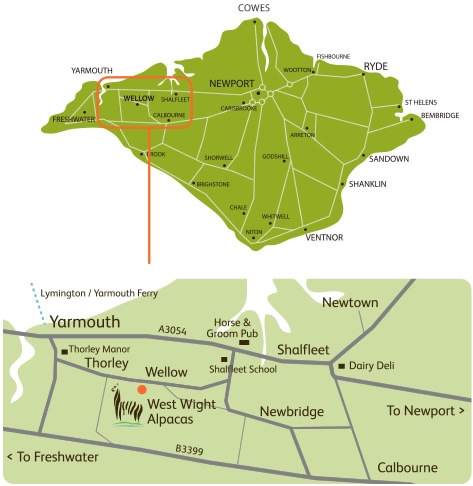 We are only five minutes away from the Lymington to Yarmouth, Wightlink ferry and the crossing is only half an hour with very regular sailings. 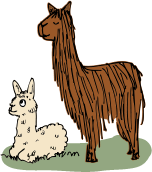 If you buy from us we will even refund your ferry fare and we are happy to deliver your Alpacas to anywhere within 150 miles of the Island for free for any purchases over £1000. If you are travelling from overseas to visit us then please contact us for advice on the best route to take. We'll be happy to help in any way we can. The Southern Vectis route 7 bus stops right outside. Directions from Newport: Continue on Forest Rd/A3054 for approx 10km, turn left onto Station Rd (opposite the Horse & Groom Pub), continue on Station Rd for 1km, turn right onto the B3401 and destination will be on your left. Directions from Middle road: Continue on the Middle Rd until you reach Calbourne, turn right onto the B3401, continue on this road for approx 4km and destination will be on your left.